Systems, policies and work flow relating to projects undertaken in partnership with Governments / NGOs. All information and reporting systems – existing and proposed. The above areas are followed for the effective and smooth functioning of the organization. These also help in better monitoring and evaluation of initiatives and in taking further steps ahead. TE or Technical/Thematic Experts: TE’s include those personnel who contribute through their technical expertise to the organization. For instance, gender experts, agri-business experts, research and documentation, agriculture experts, etc. SMT or Senior Management Team: SMT comprises of the Chief Functionary, Director Programme, Systems Manager, one representative from the Regional Coordinators, and one representative from the TE’s. This team would be a decision-making authority at the management level in the organization. 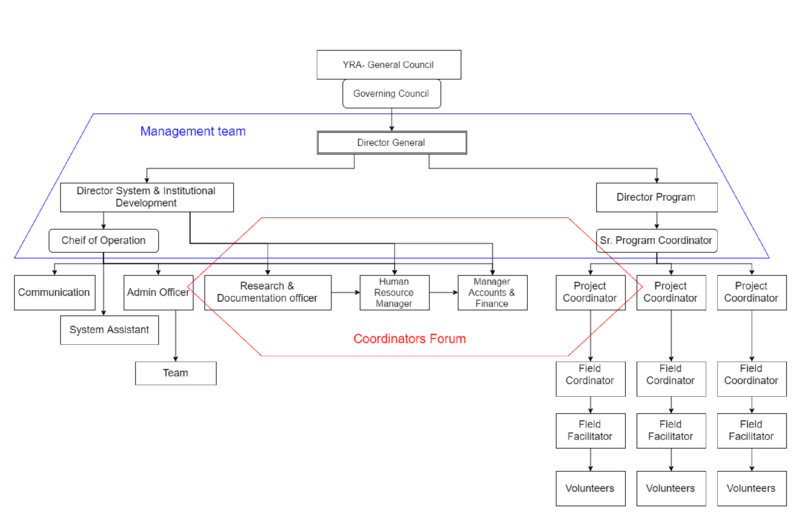 YRA-C or YRA Collective: YRA-C comprises of the Chief Functionary, Director Programme, Systems Manager, Regional Coordinators, District Coordinators, Account and Admin Personnel, TE’s and other invited staff and resource persons on a need basis. This forum would be a reflective and recommending forum for the SMT and the Governing Council of the organization. Regional C/M or Regional Coordinator/Manager: As per the strategic plan, regions A, B and C have been formed. Currently, regional coordinators have been selected for A regions and they are looking after the functioning of the B and C regions as well. DC or District Coordinator: DC’s have been selected for the A regions. They are looking at the overall functioning of the district. P or Projects/Programmes Staff: This includes the staff involved in the projects/programmes being implemented in the respective districts.